Michael Volker is an Entrepreneur active in the development of new high technology ventures. A University of Waterloo Engineering grad, Mike started his own company (Volker-Craig Ltd) in 1973. After selling his company in 1981 he decided to work with entrepreneurs in building new companies. Recently he directed Simon Fraser University's Innovation Office. Presently, he is chairman of TIMIA Capital, [TCA.V] a public company that invests in young growth companies. He is CEO of WUTIF - the Western Universities Technology Innovation Fund - an "angel" fund for start-ups. 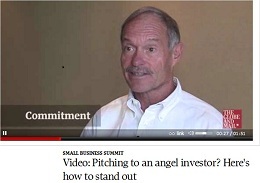 Mike is President of the Vancouver Angel Network, VANTEC and the Vancouver chapter of Keiretsu Forum. He's chairman of New Ventures BC - an annual business competition. Mike was chairman of the Vancouver Enterprise Forum for several years. Business Basics for Engineers is a series of notes prepared by Mike on business matters relating to technology companies. A guide for writing a Business Plan is featured. Two other websites that Mike created are: www.hitechbc.com and www.moneylinks.ca. Business begets business. Successful entrepreneurs invest profits from their business in new ventures. These “angel investors”, and the critical role they play in the innovation landscape, are not well understood by policy makers. Instead of amplifying their nascent contributions, the new tax proposals may keep them at bay. This is because the proposals will make it unattractive for angels to use business income to invest in new startup ventures. Equity Crowfunding – the selling of shares in new ventures to the general public – can give entrepreneurs access to a vast resource of new capital. While this will stimulate the creation of more companies and jobs, not everyone thinks that this is a good idea. Securities regulators are worried about investors losing out due to fraud or flaky deals – not to mention the high risk associated even with the best deals. This article puts forward some suggestions – for discussion purposes – on how we can make it work – right here in Canada.